Looking back, the year 2012 was one of the hardest years of my life. To handle work, home, and school I injected myself with an overdose of café Americanos and was under constant red alert. * Work became evermore demanding with extra projects and committee work with no time that I felt it could only get done if I split via mitosis. Home became an empty house haunted by the people who used to live there. Once in a while I’d see signs of life when things moved or dishes got washed. It was cold and empty just like the relationships I once had with the people who lived there. And school, I was approaching the end, which meant daily café Americanos, acute senioritis, and a blank computer screen with a due date in the next couple hours. I stayed afloat as long as I could. However, the weight just got too heavy and it gave way to a new beginning. Bryan, Chanida, and Danny wishing everyone a Happy New Year! Moving forward, I gave up most of my committee work and am focusing on innovations. I had done so much good work already it’s time to reinvent it by celebrating our successes and doing programs that no one else is doing. I’m teaching again and making new connections every day. And when I go home, I am at peace after having moved out to my own place—warm and welcoming—a place for my whole self. And school, hallelujah I am done and finished my master’s program with a 3.92 GPA (yes, I will flaunt it). There were times, however, when I wanted to give up, but after moving, I found my acceptance letter and that gave me a stop-sabotaging-yourself-and-get-your-sh!t-done reality check slap to the face. Reflecting on 2012 conjures up arduous memories, but only as motivational fuel as I fly higher in this New Year. I don’t know what exactly will happen, but I know that I’m in control of me and what I want and I’m expecting many new and exciting things to happen. So far at work, I’ve been told I am getting a promotion (crossing my fingers) and about damn time! 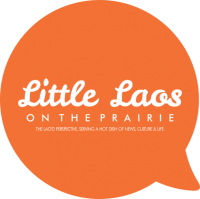 Little Laos on the Prairie is going to get bigger, bad-er, and better as we hope to be doing a lot more with the Lao community (I can’t give too much away) and connect with Lao Americans doing everything imaginable. I have been getting gigs to do a few photo shoots this year, so what time I don’t spend looking for PhD programs I will spend taking pictures of my life in 2013. I hope that you all were able to celebrate the closing of 2012 with newfound excitement and appreciation. On behalf of LLOTP, I wish you all a HAPPY NEW YEAR and MANY GOOD WISHES this 2013! *Star Trek reference. So? I’m a Trekkie.